Train to climb Mount Rainier in 16 weeks! Of the approximately 10,000 climbers that attempt to summit Mount Rainier each year, slightly fewer than 50% succeed. You can’t control the weather, but you can stack the odds in your favor by following the training in this book. In Fit to Climb, John Colver lays out a 16-week training program for mountain athletes. If you’ve decided to climb Mount Rainier, one of the most popular summits in the world, this book is essential reading. 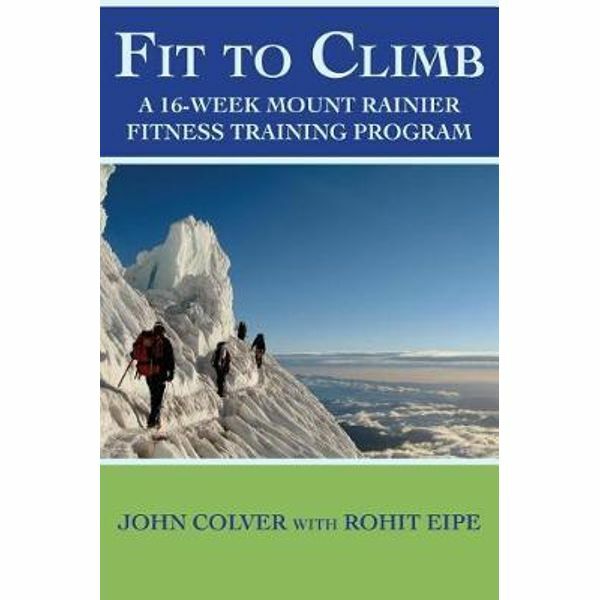 Train smart using the right blend of aerobic, anaerobic, and strength workouts, including long hikes, stair workouts, circuit training, and John’s exclusive “Rainier Dozen.” Prepare yourself for the mountain adventure of a lifetime! In summary, the training plan in this book has the components you need to help you prepare for this big challenge. There is strength, cardio, hiking training, and he talks about the mental aspect of dealing with the challenges you will face on Mt Rainier. What makes this book unique is the description of the segments of the route and what to expect. I think this is helpful in preparing you mentally, and it gives you a visual of the route. When I train, I visualize being on the mountain and it helps me to train harder. I’m following the plan myself, for my next climbs in Sierra Nevada and on Mt Rainier. There are other good books out there for different types of mountain climbing and expeditions, and I think if you work a 40-hour week, and don’t have a lot of time to train all week, this book is helpful and is geared specifically for how to climb Mt Rainier.